The Council on Energy, Environment and Water (CEEW) along with other international partners, including the British Foreign and Commonwealth Office (FCO-UK), recently undertook a risk assessment of climate change impacts across the world. As part of it, a war game scenario exercise was undertaken in India which Sir David King, the UK Foreign Secretary’s Special Representative on Climate Change, led with CEEW. The gaming exercise highlighted two important points: (i) climate impacts will further pressurise the security establishments of countries across the world, and (ii) for ensuring national security, defence personnel will need to engage not only with defence experts, but also with climate scientists, social scientists, and economists. As a follow up of the joint research effort, CEEW and the Institute for Defence Studies and Analyses (IDSA) held a roundtable discussion with some key defence and national security experts of India to elicit views on the critical issue of the implications of climate induced risks for national security and on how these can be mitigated. The discussion aimed at initiating a long term and deeper engagement of scientists and policy makers with Indian defence and national security experts. The discussion started with welcome remarks by Mr. Jayant Prasad, Director General IDSA. In his opening remarks, Mr. Prasad stressed that national security is a paramount concern for India, and experts on national security need to be aware about threats to national security arising from various quarters. Our defence forces deal with natural formations like ice-capped mountains and rivers and any impact on these is bound to have concerns for national security. He highlighted that the cross boundary issue is very important. Any intervention in China as a response to climatic disasters can have huge implications for India. The national security community has until now mainly dealt with traditional threats while the climate community has dealt with climate impacts in a general way. It is important that these two communities interact and there is an improved understanding of climate change impacts on national security within India’s defence establishment. Dr. Arunabha Ghosh informed the participants about the global climate risk assessment work undertaken by CEEW, UK-FCO, Harvard University, and Tsinghua University jointly. He informed that this risk assessment exercise was based on intensive collaboration with domain experts. One of the most interesting elements of this assessment exercise, that is relevant for the internal security debate, was a war gaming exercise. This war gaming exercise was hosted by CEEW in India, and had representation from the scientific community, defence community, and policy making community across the major nations of the world including China, India, UK, USA among other nations. The exercise highlighted that we live in a probabilistic world, and climate change impacts will increase the uncertainties around the weather systems. Planning for resource management will have to deal with these increased uncertainties. In addition, there could be unforeseen shocks to the system with unexpected responses from various countries that will pressurise the national security establishments. The aim of this discussion is to start a dialogue between the national security and climate risk communities within India and prepare for these newly emerging challenges to India’s national security. 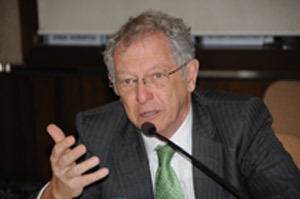 Sir David King in his special address discussed three important themes. First theme was of environmental migration. He informed the group that one of the reasons that led to the Arab Spring was the sharp increase in food prices. Environmental impacts are manifested in different ways. Many of these are catastrophic extreme events like cyclones and floods. The difference is in terms of how long-lasting the impact is. A drought can increase the prices of essential food commodities for the whole season/year. Such shocks impact a large section of the society, especially the poor, who are forced to migrate, creating pressure on resources and infrastructure on other parts. This leads to an increase in conflicts and has implications for national security. Second theme was of climate risks. Science has unequivocally shown that climate impacts are increasing. There are different kinds of risks - systematic risks and unsystematic risks. We need to have a better understanding of both. Once we understand the different kind of risks, we need to understand their probabilities, most likely to least likely. Sir David emphasised that we need to plan for not just the most likely impacts, but also for impacts that are less likely but have catastrophic implications. Both systematic and unsystematic risks will have implications for internal as well as external security that needs to be understood in a better way. Third theme dealt with global cooperation. In terms of the response of governments, national security is generally based on unilateral actions. Responses to climate change related impacts could however lead to wider cross-country conflicts. For example, the war gaming exercise led by FCO-UK and CEEW with other partners highlighted a scenario in which there is a climate change induced drought leading to high crop production losses in China, because of which China stops exports of key crops. This leads to similar protectionist measures by other countries and an increase in global commodity prices leading to unrest and conflict within and between countries. Countries across the world think about their own national security, not of the larger world outside. Impacts of climate change cannot be managed this way. Global cooperation needs to be enhanced for addressing national security implications due to climate change and there is no alternative to this. An evolved understanding of national security: An interesting point raised by the security experts was that the traditional way of looking at national security and defence has largely been determined by geopolitical concerns. The evidence and insights shared by the experts on climate risks however suggests that national security and defence will need to be viewed from an angle of natural environment and climate impacts as well. Does this mean that we are proposing a new theory of war and national security? This is an interesting question and needs to be reflected upon by the stakeholders. Improved risk assessment methodology: Our understanding of how to characterise risks is improving, but it still has a lot of room for improvement. It is clear that we need to have more rigorous analytical frameworks for a better understanding of climate risks. It was recognised that there are private insurance firms that have quantitative experts trying to better characterise climate risks. However how climate risks can impact national security adds another layer of complexity to it. Current risk assessment frameworks are a very good beginning, but are limited in nature. Risk assessment experts need to enhance and improve the methodological framework for better understanding of risks and their linkages with national security. Existing risks to the defence forces: Climate change is always perceived to be a very long-term debate, with a horizon of many decades. We need to realise that impacts are already happening. Incidences like avalanches and flash floods have been increasing and this has negatively impacted our defence forces. Location of military bases could be impacted by global warming and climate change. There are such near terms risks for our forces that need to be identified and adapted to. Climate change impacts can’t be viewed as only a long-term risk anymore. Increasing pressure on disaster management forces: Armed forces are being increasingly called upon as an initial point of response to natural disasters in India. There is an opportunity cost of using defence forces for disaster management. As the frequency of disasters increase, the resource allocation for the military too needs to increase. Hence climate change also impacts resource planning and allocation, and this aspect needs to be considered while understanding linkages between climate change and national security. A longer term engagement between national security and climate risk experts in India: It was highlighted that Indian experts on national security have until now not engaged intensively with the climate risk experts. Also, the climate risk experts in India have focused on improved understanding of the risks but have not engaged with the national security experts informing them about the implications of climate change induced risks for India’s national security. The current discussion was intended as a first step in that direction and both these communities have to ensure that there is a continuous and long-term engagement between them. Dr. Uttam Sinha gave the final vote of thanks to all the participants for engaging with this process. He mentioned that the views of national security experts are critical for better understanding of how climate risks would impact national security, as well as an improved understanding of climate risks itself. He re-emphasised that there is a need to build an understanding of climate risks within India, and it is critical now that we build on earlier research as well as the day’s discussions to institutionalise cooperation between the climate risk and national security communities within India. It is imperative that we strengthen this long-term cooperation for enhancing India’s national security.